MPN: MFCL2740DW. Model: MFCL2740DW. Connect via wireless or wired networking or USB. Print/ copy speed up to 32 ppm. Duplex printing with single pass duplex copy/scan/fax. 2.7&apos; touchscreen display. Monochrome laser all in one. Connect via wireless or wired networking or USB. Print/ copy speed up to 32 ppm. Duplex printing with single pass duplex copy/scan/fax. 2.7" touchscreen display. Mfr Part #: MFCL2750dw. Print speed specifications gathered from manufacturer websites as of 1/9/2017. (2) Requires connection to a wireless network. (4) Requires an Internet connection and an account with desired service. Updated to improve office efficiency for the small or home office, the new Brother Compact Laser All-in-One includes multiple features to streamline the office experience. The up to 50-sheet automatic document feeder helps you save time with single-pass duplex (two-sided) copying and scanning. The MFC-L2750DW also features multi-page copying, scanning, and faxing. It leads the class by delivering lightning-quick printing of up to 36 pages per minute with exceptional quality. This new model is the replacement for the dependable MFC-L2740DW. 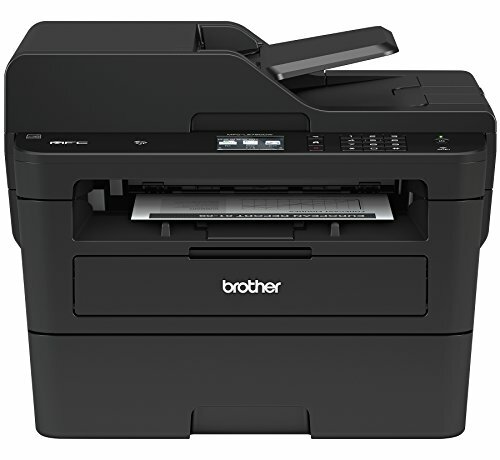 This all-in-one laser printer offers “Touch to Connect” printing and scanning with the NFC feature that permits added consumer convenience. Users can print from and scan to multiple Cloud-based services directly from the 2.7” color touchscreen, including Google Drive, Dropbox, Evernote, OneNote, and more. This all-in-one printer is designed with a 250-sheet paper capacity tray that helps improve efficiency with less refills. The MFC-L2750DW can handle letter or legal-sized paper and prints with exceptional quality. You can also save money by using Brother Genuine high-yield (TN-760) or super high-yield (TN-770) replacement cartridges, which are available through Amazon (also compatible with TN-730 replacement toner cartridge). The Brother Compact Laser All-in-One comes with a 1-year limited warranty and free online, call, or live chat support for the life of your printer. At Brother, we want to ensure that your experience with us is exceptional. 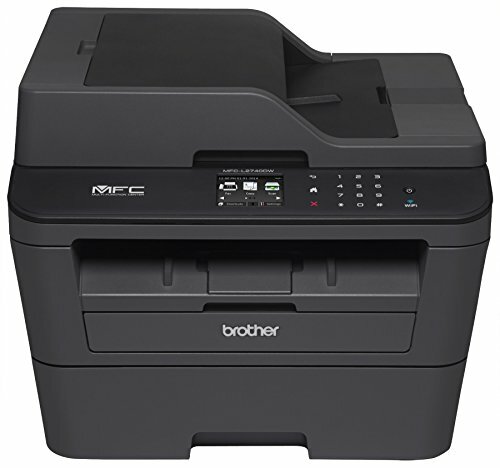 If your home or small office is looking for an efficient and user-friendly all-in-one printer, add the Brother MFC-L2750DW to your Amazon shopping cart today. (1) Based on competing in-class monochrome laser multifunction printers under 300-dollars. Print speed specifications gathered from manufacturer websites as of 1/9/2017. (2) Requires connection to a wireless network. (3) The mobile device must have NFC capability and run Android OS 4.4 or later. (4) Requires an Internet connection and an account with desired service. (5) TN-770 Super High-yield vs. TN-730 Standard Yield. Up to three times more prints and lower printing costs based on yields and MSRP. Standard yield and Super High-yield cartridges sold separately. (6) Approx. toner cartridge yield in accordance with ISO/IEC 19752 (letter/A4). (7) Reprinted from PCMag with permission. Copyright 2017 Ziff Davis, LLC. All Rights Reserved. (8) Approx. 300 pages per month in accordance with ISO/IEC 19752 (Letter/A4) using the 2 toners provided in box. - Upon activation, the Amazon Dash Replenishment service measures the toner level and automatically orders toner from Amazon when low. This ensures that you never run out again. - Fast high quality printing and copying up to 32 ppm and up to 2400 x 600 dpi resolution.Operating Temperature:50 °F to 90 °F (10 to 32 °C) "